Our total does not equal the total of Smartmatic and this could be because the exact figures for the a) total local registered voters and b) the total overseas voters used may be different. 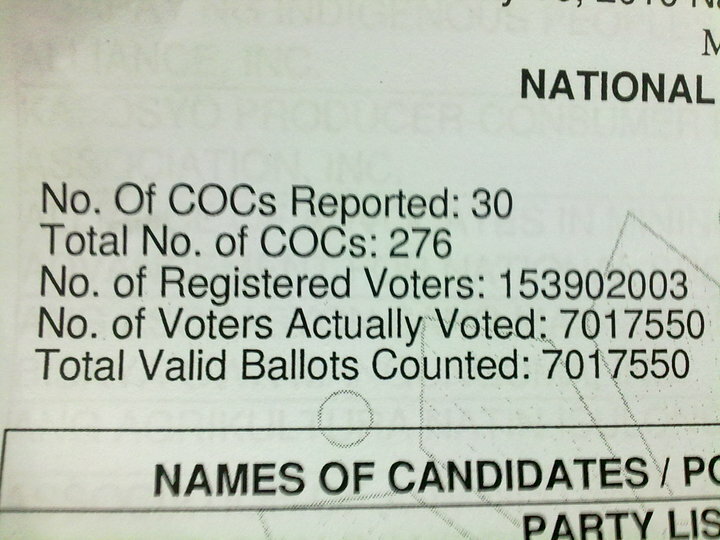 Nevertheless, note that if the explanation of the Smartmatic official for the computation mistake is correct, then the Smartmatic magic number of 153,902,003 should be multiples of 3 or exactly divisible by 3, which it is not. When one admits of “computation mistake” in a 7+ billion-peso high-tech project that is supposed to count each vote correctly and do additions correctly in several levels, computation mistake is a serious thing to worry about. If a programming error can result in computation mistake in the simple task of displaying the total registered voters, is it not also possible that some programming errors with resulting computation mistakes did occur in the other computational routines? This issue has to be addressed to clear all doubts and because we have another elections coming in 3 years. Entry filed under: Email. Tags: Comelec, computation, Elections 2010, math, May 2010, Smartmatic.